I have wanted a wrapped canvas forever and a day. someday it was destined to become the canvas of my dreams. The wall above the fireplace was sad and lonely. Screaming for a big canvas of cuteness. Each day I would stare at the blank wall. Dream that a magical fairy would grant my wishes. Guess what showed up on my birthday? Besides my girls... guess what is my fave? How rad are these edges???? I just stare at them. Every single bit of it amazes me. But guess what is even more amazing? But not here. Nope. Better than here. Over at the Project 320 blog. Each and every dream has been exceeded. 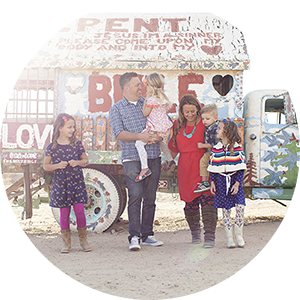 The second well is nearly funded. See Janey's stocking up there? Is it bugging you that it doesn't match? Well it's fake. I haven't made hers yet (too busy waiting for water to boil) and it was making me CRAZY seeing an empty stocking holder in the picture. So I doctored it up at Picnik. Don't tell. A year of Picnik premium is part of the bonus bundle too. Just in case you don't get to finish your stockings either. Fake it until you make it. Literally. Just saying. I totally noticed the stocking. But just because I have 3 and some things in our house don't match like that & it bugs me to no end! Lovely picture! I'm totally jealous! In the very most Christian sense of the word of course. Yay for the bonus bundle! I cannot believe that canvas! Camden still uses her PBK 1st Christmas stocking cause I can never get it together to buy her a big girl one to match Chloe & Chayse's. Happy birthday Julie! I hope your day is full of blessings! And that pic is RAD! That is so beautiful!! Your girls are just stunningly gorgeous!! That canvas makes my heart sing! I have a picture of my girls that I would love to have printed on canvas. What a wonderful gift!!! Happy birthday! I love it and am beyond, beyond jealous!! I am GREEN with envy, not that I want a picture of your girls, but I would like a gallery wrapped picture of the pic I have posted right this very minute on my blog. somehow, someway i will aquire that picture in a wrapped way!!! Yours looks amazing, fake stocking and all. It is a beautiful picture of your girls, and if I didn't have a girl of my own I would want a picture of your girls above my fireplace. Hope you had a happy day!!!! From one Julie to another Happy Birthday!!! i totally noticed because i am in the middle of making 3 new stockings for my 3 as well. your canvas is amazing! what a gift! I LOVE the canvas! 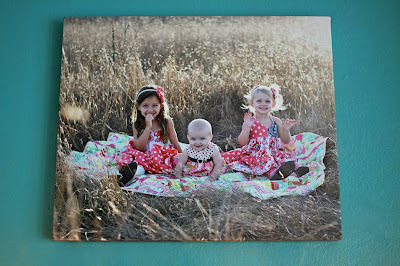 I'm a huge fan of photos printed on canvas and even toyed with the idea of printing them as a job. My hubby is a photographer so I am blessed to have amazing pix of my kids. Recently, he ordered a bunch of canvases from different companies to see which ones he liked best. My FAVORITES are the ones that are gallery wrapped (printed that wrap around the sides like yours) now I look for blank walls for an excuse to get more canvases! 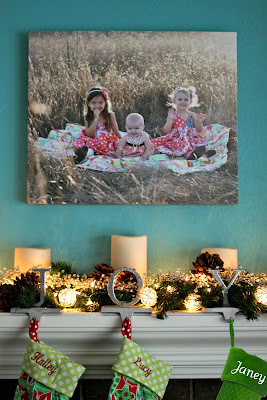 Love the canvas, and especially love that the stocking hangers say Joy! You do such a good job of keeping her legacy remembered. Thanks for entertaining this loyal reader on a daily basis. What a beautiful picture! I love it! what a wonderful bonus bundle!!! That looks WONDERFUL! I'm with you- I totally want one now. Probably because that picture is just perfect. What gorgeous little girls! What a beautiful canvas!... I'd like one of these for my mantel too! I missed the stocking! Looooove Photoshop. 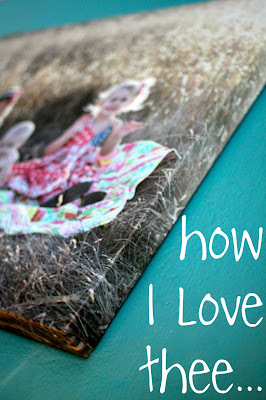 LOVE photos on canvas even more. One of these days I’m going to own one too; but deciding on ONE photo is going to be hard. Maybe I’ll have to get a few smaller ones because we don’t have a fireplace and mantel to showcase one anyhow. 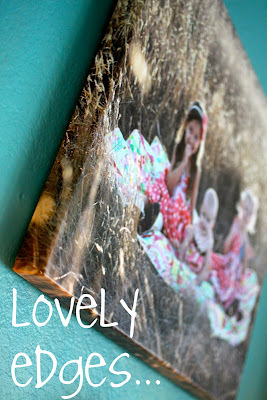 SO jealous of that awesome canvas! !